Today I’m sharing the best taco gifts I found on Amazon Handmade. I know we’d all like to give handmade gifts. Sometimes we just run out of time to create all the Christmas gifts we’d like to give. But even when you run out of time, you can still give a beautiful and unique Christmas gift with a little help from Amazon Handmade! I put together a big basket of taco gifts for a special taco lover on my gift list. I can’t tell you who yet… they might be reading this article! My taco gift basket included a couple of fun signs, two kitchen towels, a magnet, and a jar of homemade taco seasoning. You could also include colorful cloth napkins, placemats, a table runner, taco plates, or taco holders. Everyone loves tacos! And everyone loves taco puns! 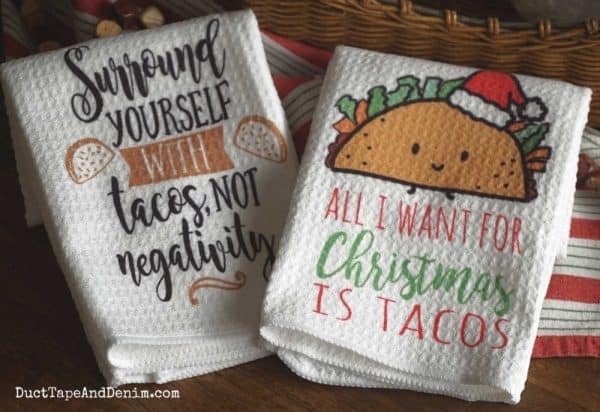 These taco gifts on Amazon Handmade will make great Christmas gifts for the taco lovers on your list. Plus, when you buy from Amazon Handmade you are helping support small creative business owners… like me! Yes, I also sell on Amazon Handmade. This first sign is 11″ x 11″ x 2″. 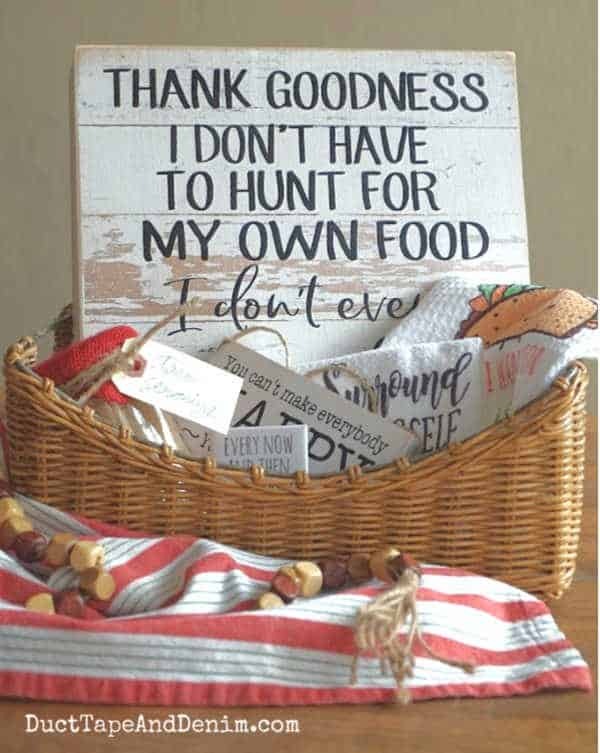 I’ve loved this quote for a while and thought it would be the perfect “anchor” for my taco gift basket — “Thank goodness I don’t have to hunt for my own food. 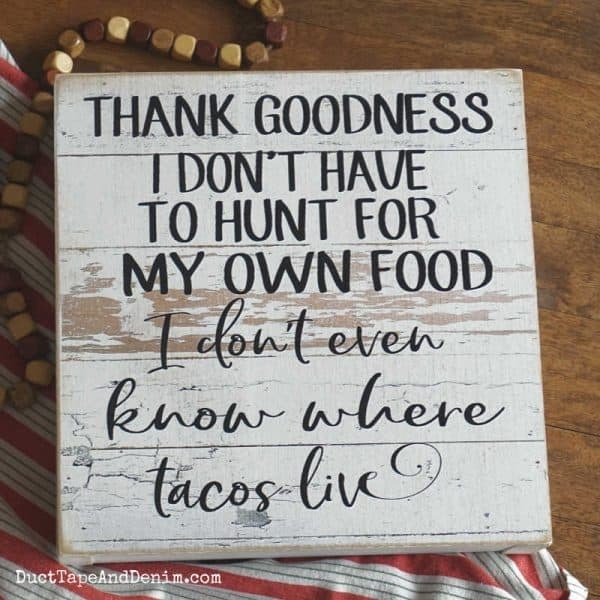 I don’t even know where tacos live.” Makes me laugh every time I see it! This next, smaller sign is a good reminder for me — “You can’t make everybody happy. 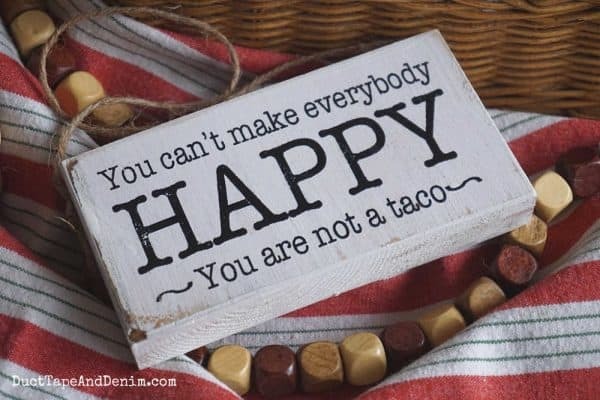 You are not a taco.” It’s about 3″ x 5″ and perfect to hang over a knob in the kitchen. Tacos Make Everyone Happy. So You Don’t Have To. Taco magnets make good fillers for gift baskets. Everyone has a fridge full of magnets, right? Felt Food Magnets – Take a look at the cute taco in this set! Tacos are messy. Your taco-loving friend is gonna need a taco towel, too. I couldn’t decide which one so I got two kitchen towels. 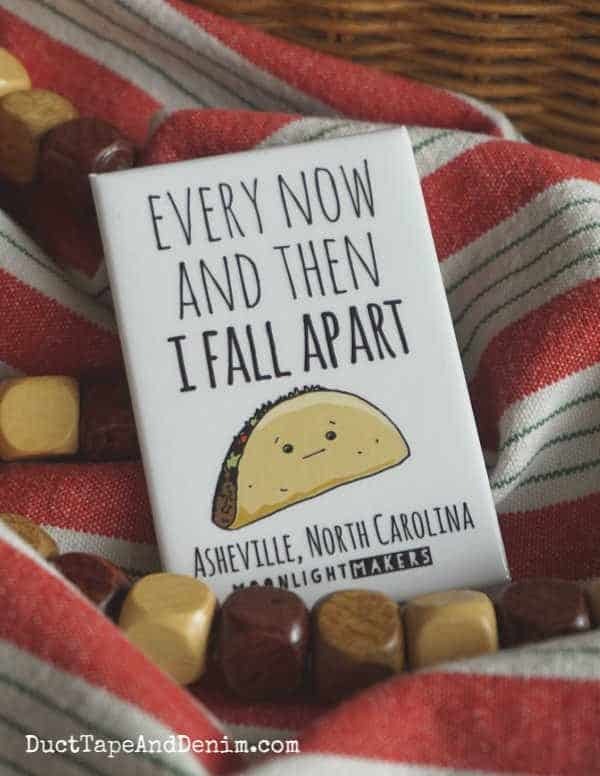 Every Now and Then I Fall Apart – matches the magnet I ordered! Thanks for reading! And thanks for supporting small creative businesses through Amazon Handmade!